A dog named “Blackie” is in need of a miracle. The three-year-old mixed German Shepherd was surrendered to the Miami-Dade Animal Services Pet Adoption and Protection Center and picture taken shortly after he lost her family reveals the depth of his terror. Sweet Blackie is so scared he won’t walk and he urinated when the staff were petting and reassuring him. 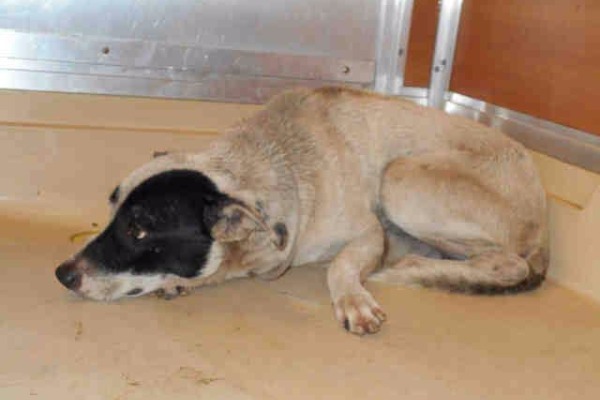 I am a male white and black German Shepherd Dog mix. This young boy’s time is nearing the close of life. Share his plight with approved rescue organizations, friends, family and social media contacts. Blackie’s options depend on all of us.